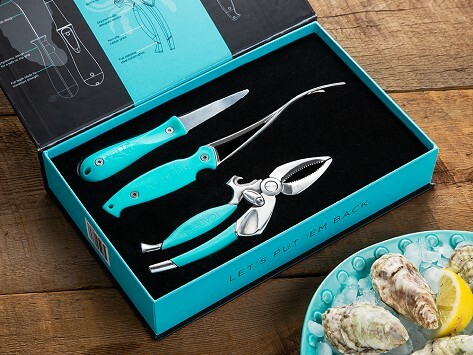 With this oyster shucker, shrimp deveiner, and crab cutter gift set, you have all the tools you need to host a serious seafood fest—and do it with less hassle and mess. The shrimp cleaner deveins, peels, and butterflies shrimp in one motion, the oyster knife has a bent tip to better open shells, and the crab cutter cracks crab shells quickly and easily. All the tools have a stainless steel blade and recycled plastic handle all while helping to give back to the ocean. Add a cut-resistant shucking cloth and you'll be set to open all the oysters you desire.